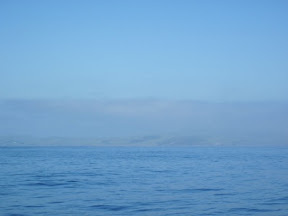 Originally, I expected to be in Morro Bay until Sunday, but the forecast had changed, predicting winds of less than 10 knots for Thursday evening and night. I saw an opportunity to get away from Point Conception and the Santa Barbara channel, where there’s 30+ winds predicted for at least a week. Morro Bay is close enough to get some of these winds and Friday was not a good day for Morro. Thus, when I woke up 6 am on Thursday morning and was met with calm winds and waves and favorable forecast for the remaining day, I got the boat ready. It took me a good hour to transfer fuel from my new auxiliary tank to the main tank. My brand new pump was broke, so I came up with a MacGyver solution to manually pump it into a 6 gallon jerry can, and the siphon it back in the main tank. Success, and by 9:30 I was underway. My first two hours were quite nice, but then the winds picked up and so did the waves. For 2 hours I tried to sail, to ease the ponding into the waves, but wasn’t making much progress so I finally gave up. As the night approached, the winds and waves continued to pick up and by the time it was dark, I was pounding into wave after wave with massive force and noise. This forced me to slow down, although the waves and currents against me had already slowed me considerably. At throttle speeds, when I usually make 5 knots through the water, I was now making less than 3 and effectively 2 knots overground. My bashing continued through the entire night and made for a miserable passage. Finally, after sunrise, the winds and waves calmed down and I picked up speed. I was now just passed Carmel and was instead seeing large swells as a consequence of a Tsunami from an earthquake in Japan. 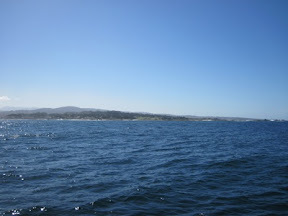 I finally arrived in Monterey around 1 pm, well after the Tsunami had hit ravaged through the west coast marinas. Luckily Monterey had no damages from the Tsunami. Santa Cruz on the north side of the bay was not so lucky. It was foggy as I left Morro Bay. Just passed Carmel. Monterey is just around the corner. Nice sunny day, and I even spotted dolphins (too far away for a picture). 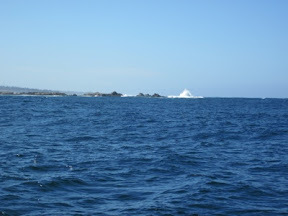 The point south of Monterey Bay. Te large swells don’t show up on camera, but you can see the spray as the swells hit the rocks. 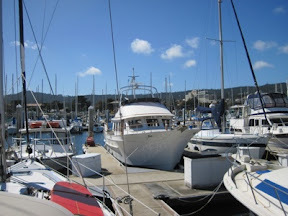 Finally safely moored in Monterey harbor. It was still surging from the Tsunami.